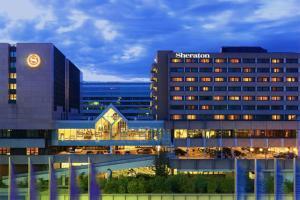 The Sheraton Frankfurt Airport Hotel and Conference Center is a two-minute walk from the airport, making it the ideal choice for travelers. Make the most of your stay in rooms that blend comfort and functionality. Warm earth tones and light maple furniture create a smart, tasteful ambiance to help you rest and recharge. The Massage & Wellness Day Spa surpasses simple pampering to provide a deeply relaxing and revitalizing experience. Enjoy local cuisine at Taverne, a cozy German pub and restaurant. The hotel offers easy access to airport, regional, suburban and inter-city train stations. Located at Frankfurt Airport's Terminal 1. The city is easily accessible by suburban rail.